Whether you are considering instituting an IR inspection program or already have one in place, obtaining competent manpower can be a challenge. One potential solution is to outsource services for additional manpower and expertise. There are many factors that will determine if a person is capable of effectively supporting your infrared program. Your success in qualifying your thermographers can be increased if you keep the following in items in mind when qualifying individual thermographers. If you choose to outsource your thermographers through an infrared consulting firm, you may also wish to check the following. Depending upon your company requirements, be sure the chosen vendor is capable of complying with security, background screening, and substance abuse policy requirements. Loose connections, overloading and imbalanced loads cause overheating of components within an electrical system. Depending upon construction and operation of the electrical system, a perplexing and possibly serious condition called inductive heating can cause non-current carrying components to overheat. As current flows through an electrical circuit, a magnetic field forms around the conductor. When current flow is high, a strong magnetic field can develop and extend for several inches around the subject conductor(s). If ferrous materials such as steel are positioned within this magnetic field, they can heat up even though they are not part of the circuit. Inductive heating can occur on bus supports, cable tray fasteners, bushing skirts and switchgear enclosures. Affected components can become hot enough to cause significant heat damage or even skin burns. The temperature of the affected component will depend upon the strength of the magnetic field, and the composition and location of the affected component. Because inductive heating can cause components to reach temperatures of over 200ºF, thermographers should pay particular attention whenever combustible materials or dielectric insulation are located near, or in contact with, an inductively heated item. Having the right tool for the job is often essential for success. When performing infrared inspections of smooth-surfaced roofs, a short wave thermal imager can significantly outperform a long wave imager. Smooth-surfaced roofs, both single-ply and built-up, can present significant challenges during an infrared inspection due to reflectivity of the roof membrane. Should reflectance be sufficiently high, areas of latent moisture may be undetectable to a thermal imager. Most infrared inspections of flat or low slope roofing systems are conducted at night by walking across the roof surface using a handheld thermal imager. This technique often results in a relatively shallow viewing angle thereby lowering the emittance of the subject roof membrane. Depending upon site conditions and roof materials, roof membranes can appear to be as reflective as polished metal surfaces. Membrane reflectivity will be especially noticeable on cool, clear nights that permit the cold night sky to be reflected from the roof surface. It will also be significant on roofs that have been coated with aluminum paint. 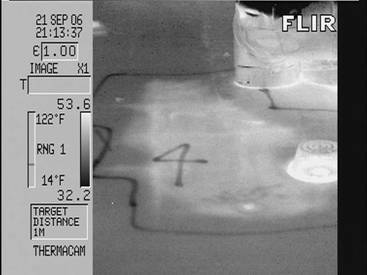 Thermal image shows warm area caused by subsurface moisture beneath smooth single-ply membrane. SW imager reduces reflections from roof membrane. To this day, the most practical way to deal with the reflectivity of smooth roof membranes is to utilize a thermal imager with short wave (2 to 5.6 micron) spectral response. This will help to eliminate reflections from the roof and can significantly increase inspection accuracy. Although long wave imagers can be used for smooth membranes, they can significantly understate the size of moisture-damaged areas or miss them entirely. Infrared inspections of low slope roofs is of the many topics covered in the Level I Infraspection Institute Certified Infrared Thermographer® training course. For information on thermographer training and certification, visit us online at www.infraspection.com or call us at 609-239-4788. It is often necessary to heat a surface to check its emissivity. Various methods are used in the field, some of which have possible problems. One method is to use a radiant heating source such as a high intensity light to heat the surface and the adjacent or contained reference which is typically a patch of electrical tape. This will cause uneven heating of the unknown (to be measured) surface in comparison with the reference surface such as electrical tape. The pickup of energy by the unknown and the reference will be impacted by their relative emissivities. Another method uses a heat gun or hair dryer to blow hot air on the surface. This should not have the pickup issues of the first method, but may be adversely affected by uneven air flow or manipulation of the dryer. A secondary issue, which may also affect the accuracy of this method, is that the unknown and the reference are rejecting heat to the surroundings by radiation at different rates due to their differing emissivities. The higher emissivity surface may actually be cooler than the unknown. This is probably a small effect and under typical usage will not impact the measurement at a noticeable level. Calculations of this effect could be performed to estimate the size of the error. I have not done the calculations. An alternate method is to heat the surface by contact. For many surfaces this can be accomplished with a hot water bottle. Carry one in your tool kit, fill it with warm or hot tap water, hold it on the surface for a sufficient time, remove and grab the image. As long as good contact is maintained, the surfaces should reach the same temperature and provide an accurate measurement. Cautions for this approach are: if the surfaces have sharp corners they may puncture the hot water bottle, if the surfaces are extremely rough the contact may not be uniform, and if the underlying materials vary considerably then the heat transfer from the surface into the underlying material will not be uniform and may impact the temperature achieved by the surface. Of course, if the surfaces are already hot, then it may not be possible to use a hot water bottle, either because it will not provide enough temperature or may fail, so be careful. Also, this method assumes that you can safely contact the surface for the required time to heat it. Affiliate marketing represents one of the newest opportunities for websites to generate revenue. With the right content, affiliate marketing can generate sufficient revenue to turn an existing website into a profit center. Affiliate marketing is a system of revenue sharing between websites. The primary participants are an Affiliate Partner and an Advertiser. With affiliate marketing, the Affiliate Partner features ads and content on his/her website that refer traffic or sales to an Advertiser’s website. The Affiliate Partner receives a fee based upon amount of traffic or sales generated for the Advertiser’s site. Simply defined, Affiliate Marketing is risk-free advertising that rewards performance. Examples of highly successful affiliate marketing programs include Amazon.com and Google. Under the affiliate marketing concept, everybody wins. Advertisers gain exposure, Affiliates enjoy commissions and increased website relevance and traffic, and customers find new products and services via familiar websites. With the right ads, Affiliates can actually generate a positive cash flow for their website. In Part 1 I discussed using a hot water bottle for heating a surface to do emissivity testing. Part 2 extends the approach to another significant application, NDT. One method of using IR for NDT depends on heating or cooling the surface to generate a thermal signature for sub-surface features or defects. Using a hot water bottle as a method to apply uniform heating to a small surface is an alternative to some of the other methods used for heating. It also offers the possibility of being used for cooling the subject surface. The rate of heat transfer and uniformity can be increased by agitating the hot water bottle during application. For larger surfaces, larger flexible liquid containers can be used. If the surface is horizontal, an open container can be used. As before, the surface has to be suitable for direct contact of any sort. It also has to be such that it will not cut or break the hot water bottle or liquid container. In other words, be careful. HVAC systems play an important role in building performance and tenant comfort. Under the right circumstances, an infrared imager can be used to help document and analyze airflow patterns within conditioned spaces. Infrared imagers are capable of detecting and displaying thermal patterns across the surface of an object. Using an infrared imager to diagnose HVAC airflow problems is a challenge since air does not have a surface. While infrared imagers cannot image air currents directly, they can detect the effect of air currents on building surfaces. Before attempting to diagnose airflow patterns, one should ensure that the building’s insulation is sound and the HVAC system has been checked for appropriate delta T, clean filters, etc. An infrared imager may then be used within occupied spaces to document thermal patterns associated with airflow. Due to its graphic nature, thermal imaging can be particularly useful when documenting results for clients. The thermal images below show an air-conditioned church interior. The left image shows the building as found. The right image shows the resulting thermal pattern after blocked air returns were corrected. Unexpected thermal patterns should be investigated for cause and adjustments or corrections made as required. Most air diffusers can be adjusted for both volume and direction. In many cases, conditioned air does not wash the walls or windows properly. Sometimes, conditioned air may be found to be blowing on the HVAC controls causing improper cycling of the system. Infrared imaging is a proven technology for detecting hot spots caused by loose or deteriorated electrical connections. It is also capable of detecting hot components associated with open neutral conductors. Basic principles state that electricity travels in a loop and needs a return path. Whether the electrical system is residential, commercial, or utility, this same principle applies. Therefore, one should see “outgoing” current flow on the main feed conductor and “return” current flow on the neutral conductor when measured with an ammeter. If the neutral conductor becomes open as a result of a failed connection or broken conductor, the return current is rerouted from the neutral pathway to a grounded object. Common problems experienced with an open neutral are lights that burn dimmer on some circuits and others that burn brighter on other circuits. Also common are lights that flicker or turn brighter when heavy loads are applied, such as an air conditioning unit turning on. Infrared imaging is an excellent tool for locating open neutral problems, especially for utility clients. The images below were captured during a periodic infrared scan of a overhead distribution feeder. The image shows an eyebolt anchor on a neutral line with a temperature rise of over 65 Fahrenheit (36 C) degrees. Not only did the discovery of this problem save unknown amounts of time to locate, it also prevented possible serious injury to an unsuspecting utility worker. Having an open neutral is a dangerous situation that should be corrected as soon as possible. With an open neutral, the grounding conductor becomes energized and can cause injury to someone coming in contact with any bare metal that is intended to be at ground potential. In most cases, open neutral problems experienced in residential and commercial buildings can be traced backed to the utility’s side of the power system. This makes sense since utility connections are far more exposed to outdoor elements that can cause breaks and failures to conductor connections. Thermographers and facility managers now have a powerful new tool available to them. Property loss prevention guidelines are now available online from FM Global at no cost. FM Global, one of the world’s largest commercial and industrial property insurers, has recently released thousands of pages of its previously exclusive property loss prevention engineering guidelines at no cost through its web site. FM Global’s Property Loss Prevention Data Sheets provide large-scale businesses, facility and risk managers, consultants, contractors and thermographers a valuable tool to help prevent property damage and maintain business continuity due to threats posed by fire, weather conditions, and failure of electrical or mechanical equipment. These engineering data sheets contain a wealth of risk prevention information on hundreds of topics, ranging from building construction, fire prevention and to industrial equipment preventive maintenance, maintenance and natural disaster preparedness. The goal of FM Global has been to remove the current barriers such as cost and licensing fees to obtaining critical property loss prevention information including access to their technical data sheets. By making this information readily available to those who need it, particularly in developing countries and emerging markets, FM Global is able to further promote risk improvements worldwide by providing engineering and research-based information on property loss prevention and control practices. To learn more about this free service or to register, visit FM Global online at: www.fmglobaldatasheets.com. HVAC systems play an important role in building performance and tenant comfort. 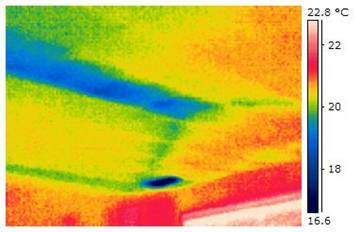 Under the right circumstances, an infrared imager can be used to help locate ductwork hidden behind walls or ceilings. Heating, ventilating and air conditioning (HVAC) systems often employ ductwork to move air throughout a structure. Identifying the pathway of ducts within finished buildings is often a challenge since ductwork is often hidden within walls or located above finished ceilings. Under the right conditions, it is often possible to detect the presence of heated or cooled ductwork by imaging the finished surfaces of a building’s interior. HVAC ducts that move heated or cooled air typically operate at temperatures significantly different than the rooms they supply. Depending upon circumstances, duct temperature may differ by 20 or more Fahrenheit degrees. An infrared imager may be used to locate ductwork whenever duct temperature is sufficient to cause a detectable temperature differential on building surfaces. appears as dark blue area. Inspection performed from building interior. Operate the HVAC system in a given area long enough to ensure sufficient Delta T. Use A/C in warmer months; use heat in cooler months. The ability to detect hidden ductwork via thermal imaging can be significantly affected by wall construction and interior finish. In general, this application is best suited for walls or ceilings constructed of drywall and having a high emittance finish. While any picture is worth a thousand words, a thermal image needs an interpreter. When thermal imagery is used as evidence, thermographers can expect to be called upon to testify. An infrared picture is more like an x-ray than a photograph in this respect, in that its admissibility at trial will depend on an expert thermographer to explain its meaning, since without that expert testimony the judge or jury may be misled rather than helped by the evidence. An expert thermographer may be hired to give an opinion in court regarding the meaning of a thermal image which he did not make. If so, it is likely that the author of the image must also be called to testify in order to “lay the foundation” for the introduction of the image into evidence. When a thermal image is used as proof of some fact relevant to the outcome of a case, it must be “authenticated” or identified for the court, which requires other evidence such as the maker’s testimony that the image is what it claims to be. Although an ordinary photograph may be authenticated by anyone with first hand knowledge of the scene depicted, a thermal image is a bit more complicated – more like an x-ray, cat scan or sonogram whose introduction into evidence may require the technician to testify that the image was taken of a particular patient on a particular day. In the same way, if a thermal image is proposed for introduction into evidence, to be used as the basis for an expert opinion at trial, the thermographer who made the image will be called as a fact witness to lay the necessary evidentiary foundation. Information that is relevant to your job in the thermography and NDT world can come to you on a regular basis as a member of the IRINFO Group. Just about every week since 2002, the IRINFO Group listserve sends out an invitation by email to a select group inviting recipients to visit the current Tip of the Week online. And, for just about as long, an email invitation is sent when the Article of the Month becomes available at www.irinfo.org. Both the Tip of the Week and Article of the Month offer information that you can use. If you would like to see what some of the previous tips have been, you may do so by visiting this link: Tip Archive. But, the listserve is not a one-way street! If you have a thermography-related question, you can ask a large number of individuals for input to help you solve it by sending an e-mail with your question to the IRINFO Group. If you have an observation that you think would be beneficial for others to know about, you can share it by sending an e-mail message to the IRINFO Group. To sign up for the IRINFO Group, complete the form on this webpage: IRINFO Group Signup. Please note that information for use of the IRINFO Group is here: IRINFO Group FAQ. But wait! If you’re reading THIS e-email, you are already a member of the Group. Please forward this e-mail to a colleague who may be interested in joining. Should you ever wish to leave the IRINFO Group, you can do so easily by sending an e-mail message to irinfogroup@irinfo.org and putting the word Unsubscribe in the Subject Line. Do NOT click reply to an e-mail message to do this, send a new message. Remember, when you click Reply to any message you receive from the IRINFO Group, your reply goes to EVERY member. To know if a message is from the Group, look for [IRINFO Group] in the Subject Line just before the actual subject of the message. If you read a message that interests you and you wish to contact that person directly do NOT click reply to the e-mail sent by the IRINFO Group. You need to create a new message and send it to that person directly. Batteries are the lifeblood of portable thermal imagers. Without them, nothing happens. This Tip provides a possible solution for solving one type of problem with Lithium Ion batteries. Two common problems with late model Flir imagers are aging of the Lithium Ion battery and the inability to charge one of these batteries because you get a blinking red failure light on the charger. In the first instance, the battery does not seem to last as long. Try to recharge in the external charger then use the battery until the first low battery indication on your imager. Do not wait for the imager to shut down! This is one of the most common reasons for the battery chargers blinking red “battery failure” light. With the first low battery indication, charge the battery as soon as possible while still in the imager. Do not use the external charger. Do this a couple of times. The charger in the imager is better equipped in most instances to (re)condition the battery. In the second instance, the blinking red battery charger light may be caused by the battery being used until completely discharged and faulting the battery’s embedded PC chip. If this indication occurs, try putting the battery back into the imager (unless shorted, the battery charge will partially bounce back when removed from the imager) and turning the imager back on. Once cycled on immediately turn it off (this resets the battery’s embedded chip) and try putting it into the external charger for recharge. If the battery now starts to charge you can breathe a little easier. If not, replacement of the battery pack may be necessary. FLIR reps and techs provided the above suggestions and I have found them to be good tips. Calculating savings and/or avoided costs is one of the most difficult tasks associated with an infrared inspection program; however, doing so is required in order to gauge how effective a program is. In short, there is no way to calculate the exact value of the findings of an infrared inspection other than allowing the component run to failure and adding up the subsequent losses. Unfortunately, this is not a practical approach to maintenance. 1. Summary of Findings – A report comprised of the deficient items found during a given time period. Reports may be by the day, month, year, etc. This type of report does not provide any financial data. 2. Performance Effectiveness Ratios – Use accounting data to trend how an infrared inspection program impacts an overall maintenance program. Typically calculated for a single facility over an extended period of time. Improvements in efficiency can be compared to similar facilities or to the performance history subject facility. 3. Avoided Costs Method – A summary of the estimated cost of repairs for breakdown versus proactive repair efforts. Typically, proactive repairs are always cheaper since the outage can be planned and the cost of the actual repair is usually less since the subject equipment often suffers far less damage when not allowed to run to catastrophic failure. 4. Permanent Improvement Method – This is a summary of the financial impact on a given facility due to the implementation of an infrared inspection program. For example, infrared can be used to supplement a maintenance program by directing repair efforts to only those areas in need of attention rather than periodic application of labor-intensive manual work. In such cases, the cost difference between the two methods results in a savings every time the manual maintenance procedure is avoided in the future. 5. Statistics Based Method – This method is based upon insurance industry statistics associated with loss claims that have been paid to clients over a several year period. This method takes into account the value of the overall facility along with the severity of the problem. While this method is not as accurate as the Avoided Cost Method, it can be applied quickly and easily with a minimum of effort. Infraspection Institute’s Exception 2000™ software utilizes this method for calculating savings as one of its standard features. Each of the above methods varies in the information provided as well as the ease of use and accuracy. We cover each method in depth in our Level III Certified Infrared Thermographer Course. When calculating savings, we recommend that thermographers consult with their end user and choose one of the above methods that will best suit his/her needs and consistently apply the chosen method over time. While you will not be able to calculate savings exactly, you should obtain a good indication of the value of your program. Many infrared consultants go about their daily tasks assuming that their insurance providers are taking care of their interests so that they do not have to worry about potential liabilities. Depending upon one’s business, a Designated Premises endorsement can create a significant gap in coverage. There is an endorsement that some insurance carriers “quietly” slip onto property and liability policies. The “Designated Premises” endorsement is a form that severely limits your liability coverage. The wording of this form does exactly what it implies. This endorsement limits your coverage for liability situations to the premises listed on the declarations page of your insurance policy. This can create several complications with respect to protecting your hard-earned assets. The first is that you very simply do not have any coverage for lawsuits or issues arising from situations that take place anywhere other than your primary office location. This means that you only have liability coverage for things that happen at your office. If you are at a client location and you injure someone or damage their property, you would not have any coverage to defend you in a lawsuit or to pay for any damages that are levied against you. This is the primary danger of the “Designated Premises” endorsement. If your work requires that you travel to client locations you should make certain that it is NEVER included on your liability policies. In addition to a general liability gap in coverage, your professional liability insurance could also be affected. In order to best determine insurance needs, a Thermographer should consult with an insurance professional who can provide the best guidance on insurance options. Among thermographers, few things can cause an acute stomach ache like damaged equipment. Damaged equipment is not only costly to repair, but may also interrupt an inspection program while the equipment is being repaired. Lastly, maintain your equipment carrying cases in good working order. Repair or replace defective or worn hardware. If your case should become worn, replace it with a new original or an after-market case suitable to the task. Some shipping cases are guaranteed for life and replacement parts may be available at no charge.